Biovation was contracted to assess and complete a remedial action plan to clean up the Yole Vero Tire site. 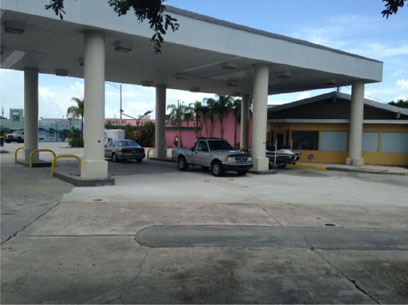 Five (5) 3,000 gallon tanks containing unleaded gasoline and diesel fuel were removed from the site in 2011; however, following a site assessment in 2012, Biovation determined that petroleum impacted soils still existed beneath an area of concrete located under the canopy at 2 ft below land surface (bls) and a larger area at 4 ft bls, totaling approximately 2500 square feet. 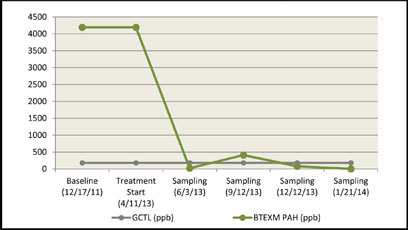 Early groundwater samples recorded BTEX levels exceeding 25,000 ppb and PAH levels near 500 ppb. Unique challenges at the site included soil contamination resting at 2 ft below the concrete area, a smear zone of 3-5 ft, including a one-foot-thick layer of significantly compressed peat/organic matter that had absorbed the contamination. 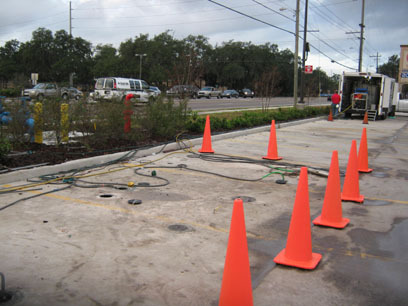 To remediate the site, Biovation utilized our Advanced Bio-Cycle® bioremediation/recycling method and our Top-Down method with numerous injection points through 8 inches of concrete. By using pressure and time, our treatment system was able to permeate the compressed organic layer with success in 8 months. Graph represents a summation of all contaminated wells. Note: Temporary well installed in the former tank pit area July 2010 reported total BTEX PAH levels reaching 29,583 ppb. 2. DOYLES MARINE SALES AND SERVICE, INC.
Biovation was contracted to assess and complete a remedial action plan to clean up the Doyle's Marine Sales and Service site. The site suffered from soil and groundwater contamination derived from a leaking 1000 gallon fuel storage tank at the site. The tank was removed from the property in 1992 along with approximately four (4) tons of soil after contamination was found; however, site assessments performed in 2008 and 2011 revealed significant soil and groundwater contamination remaining. The total contamination encompassed approximately 10,000 square feet of the property and impacted five (5) groundwater monitoring wells with total BTEX levels reaching as high as 80,000 ppb. Soil lithology at the site included a 6" thick layer of significantly compressed peat/organic matter and 6" thick layer of heavy clay beneath that. Biovation was selected to replace another consultant that had proposed a sparge/vapor extraction system. Biovation proposed our Advanced Bio-Cycle® method to treat the contamination and negotiated a Performance-based Contract (PBC) with the Florida Department of Environmental Protection (FDEP). Biovation performed a Limited Source Removal of about 100 tons of contaminated soil which was disposed of in a certified burn facility and then implemented our Advanced Bio-Cycle® method and Top-Down method. Microbes were injected into the smear zone by top-down soil injection points. Biovation was able to enhance microbial activity with bio-sparging with significant results in 6 months. Biovation was contracted March 2014 to clean up remaining groundwater and soil contamination at the site. Four (4) underground fuel storage tanks were removed in 2010. Soil testing confirmed contamination levels higher than groundwater cleanup target levels (GCTL). Due to the soil testing results, a source removal of contaminated soil was performed. The former consultant subsequently attempted their own bioremediation efforts but no improvement was noted after 1-year of treatment. Biovation's solution was to utilize pre-existing injection wells at the site and add two (2) extraction wells to begin our Advanced Bio-Cycle® method to treat the contaminated area. Trenching was necessary for conveyance lines to accommodate an active boating retail store. Microbes were injected into the injection wells and recirculated throughout the area by the two extraction wells. Treatment lasted for 95 days. 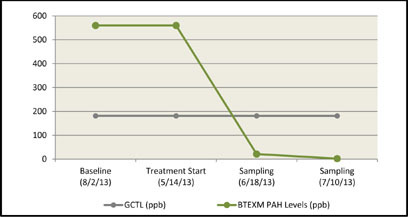 Groundwater results showed that both previously contaminated monitoring wells now meet GCTL and PARM was started. Biovation was contracted to assess and clean up groundwater contamination at the Yeatter-Henderson Trust #41 site in North Fort Myers, Florida. The site, which was previously operated as a full-service truck stop, reported a discharge event in 1992 thought to consist of diesel fuel. The site was eligible for state funding but priority scoring thresholds prevented funding from being available for many years. 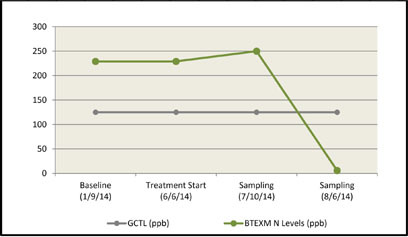 Biovation performed a Low Score Site Assessment (LSSI) and found benzene, ethyl benzene, 1-methylnaphthalene, 2-methylnaphthalene, naphthalene, and TPH contamination in excess of state target levels in the groundwater in one monitoring well. Biovation utilized our Advanced Bio-Cycle® method to treat the contamination located in the smear zone. Microbes were injected into the smear zone by top-down soil injection points and recirculated through the area by one recovery well. Treatment lasted for 60 days. Groundwater results show benzene, ethyl benzene, 1-methylnaphthalene, 2-methylnaphthalene and naphthalene concentrations to be undetectable. 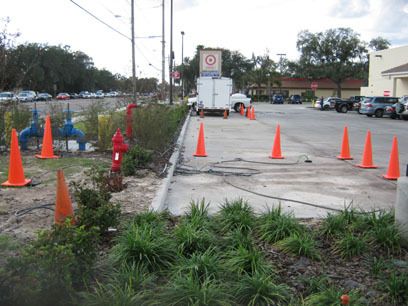 Biovation initially conducted a pilot test at BJ's Wholesale Store in Melbourne, Florida to clean up benzene and MTBE contamination at the site. The site was extremely unique due to the contamination being trapped below a confining layer located 15 feet under the surface. A prior attempt by others to clean up the site with an air sparge/soil vapor extraction pilot test failed-causing channeling to occur within the aquifer and did not clean up any of the contamination. Biovation's objective was to prevent the contamination from spreading off-site. Biovation commenced pilot testing utilizing our Advanced Bio-Cycle® bioremediation/recycling method. Before treatment began, groundwater samples taken on 7-27-2010 reflected that Benzene levels were 46 ug/L and MTBE levels were 14.7 ug/L. The pilot site was treated for 3 full days, ending on 7-30-2010. The site was again sampled on 8-25-2010. 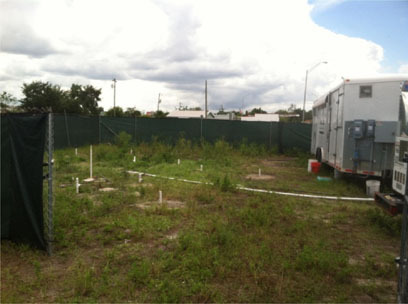 These site samples reflected that Benzene contamination was non-detectable and MTBE levels were at 3.00 ug/L, which is well below the maximum groundwater target levels of 20 mg/L as required by Florida Department of Environmental Protection. The total pilot treatment duration was 30 days. GCTL was achieved August 24, 2010. Following the positive results from the pilot, a full-scale cleanup started December 6, 2012. The full-scale cleanup encompassed 19 treatment zones and over 30,000 square feet in the southwest corner of the property. Biovation utilized our Advanced Bio-Cycle® method and injection wells to treat the contamination. Treatment would commence for a period of one week per zone then the trailer would be relocated by Biovation technicians to the next zone. This was the pattern over the entire 19 zones. Biovation completed these treatments in 4 1/2 months. Biovation worked under a Performance-based Contract to achieve site closure after a previous source removal and chemical oxidation treatments failed to clean the property and the site reached its state funding cap of $400,000. The site had BTEX contamination of approximately 6000 ppb, with naphthalene and methylnaphthalene contamination at a depth of 12 to 20 feet. Site lithology was a very fine sand and clay backfill as a result from a previous source removal. Site dimensions were approximately 30 feet by 30 feet. 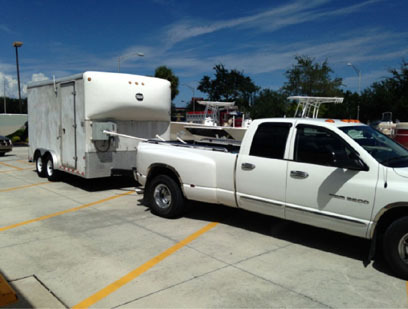 Site photos show trailer and hose setup. The trailer was parked a distance away from the treatment area and hoses were neatly run out of the way in the shrubbery to minimally disrupt access to the storeallowing the business to remain open. Learn more about our Treatment Results and find answers to Frequently Asked Questions. © Copyright 2012 Biovation Environmental Services, LLC. Formerly known as Bioworld. Not affiliated with BioWorld Products, LLC. All rights reserved.